The folks here at Karma-Kara-ma are a pretty right on bunch when it comes to matters of world peace, semi-skimmed milk and protecting our funny little planet (cos we have only one of 'em you know). We don't get taxis everywhere (well, some of the lazier ones do), we try and recycle paper and stuff (we got a bit confused about recycling toilet paper - it got all a bit messy), and of course, as you know dear reader who has nothing better to do with their day than read the ramblings of a bligblog, we loves our bicycles. Well, I love this. You've probably seen it on all those coolhunting websites that you are subscribed to but delete every morning in-between all the cheap viagra spam. 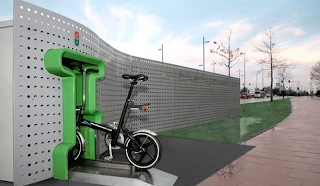 It's a scheme running in Amsterdam where the people of that fair city 'borrow' a bike from one of these dispensers, ride around a bit, buy some clogs and papers and stuff and then deposit it back at another dispenser. Oh the joy of altruistic behaviour. Anyway upwards, I've found out the supplier and I'm very excited about getting a couple for our new building (which we still haven't found yet - more on that in another posting) so we can allow Karmacrew and clients alike to pootle around town on nice little bikes. What a lovely idea. Of course it will never happen because the minimum order will be about 10 squillion, but I can dream can't I, I can dream?